Many trainers and experts talk a great deal about the “pack dynamic” in our canine companions. Similarly, cockatiels and other social parrots have a “flock dynamic” (which is similar, but with distinct differences). Understanding this kind of social dynamic in our cockatiels is very important to bonding with them, and I’ve found it to be absolutely vital in everything regarding their care, from training, to understanding their behavior, to introducing new foods. It doesn’t take long for new owners to see that their new pet parrot is a little bit different from other pets, such as cats and dogs. Here is one big reason why: parrots are NOT domesticated animals. They are “exotic” pets – which is a fancy word pet stores use that means “wild-animals-that-happen-to-live-with-people.” This doesn’t mean that ‘tiels can’t bond with their human or make good pets, but it does mean that all of their instincts are intact, and their unique needs need to be met. But here’s a good way to start: understand the behavior of wild cockatiels in Australia, and you’ll understand your own pet cockatiel. And this leads us back to that “flock dynamic.” Cockatiels spend their entire lives with their flock. There is never a moment when they’re left completely on their own. Cockatiels left alone in the wild are vulnerable to predators, so they’ve developed a nifty way of keeping track of each other, known to ‘tiel owners as the mighty flock call: a series of shrill loud screams that can be heard over long distances. Flock calling is normal behavior in a pet ‘tiel, and they often make this call when their human flock members leave the room or walk out the front door. Because they are never left alone in the wild, our bonded cockatiels would go anywhere we go, if it was up to them. 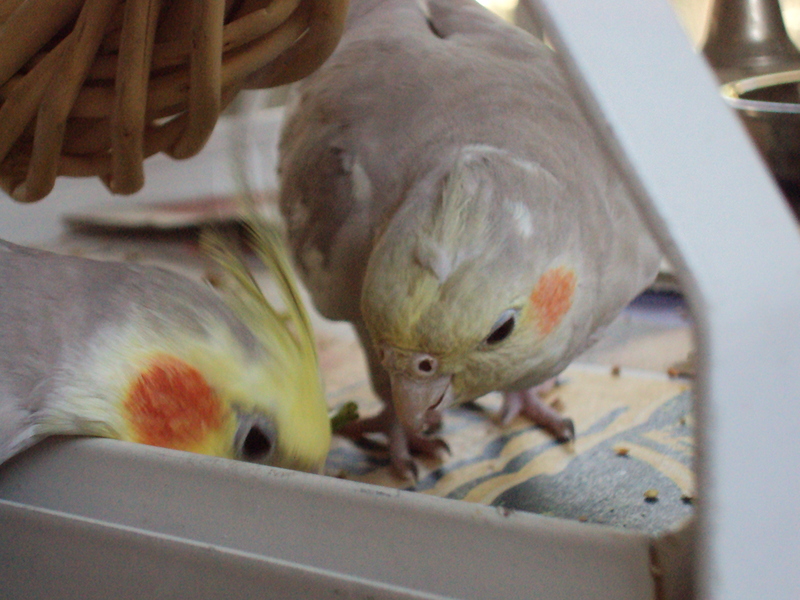 Therefore, socialization and bonding activities such as eating together, cuddling, and training are very important to a cockatiel’s emotional wellbeing. I do not believe acquiring a second bird on impulse is ever a good idea, but in my 16 years of experience, cockatiels seem happier when kept in groups of two or more rather than alone in a human household.